Ontario's largest non-profit housing advocate is concerned by campaign's focus on middle-income earners. Photo by Vik Pahwa, from the Torontoist Flickr pool. Politicians have failed to focus on critical housing issues over the course of this election campaign, according to Ontario’s largest advocate for non-profit housing. Sharad Kerur, executive director of the Ontario Non-Profit Housing Association, said in an interview last week that political parties and their leaders are ignoring issues related to poverty and the need for systemic change. “I think I speak for many people who are disappointed that not one of the parties has put even an honourable mention of housing as part of their platforms,” Kerur commented. Instead, the parties have concentrated mainly on policies for middle-income earners. “I don’t hear a lot about transit or housing or poverty reduction, or fixing the systems around [the social assistance program] Ontario Works … We’re missing the big picture,” said Kerur. 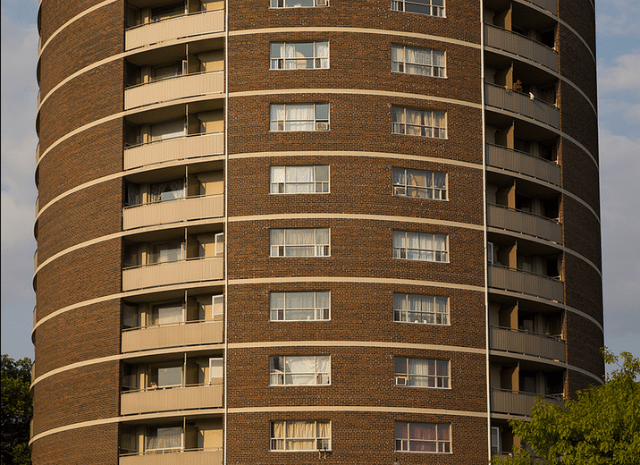 Toronto’s social housing crisis is part of a larger provincial problem. Nearly 168,000 households are on affordable housing wait lists across Ontario—a household can include several family members, so the actual number of people waiting for housing is much larger. “That translates to anywhere from three to eight years of wait time, depending on what you can afford,” Kerur said. Nearly a year ago, Toronto launched a “Close the Housing Gap” campaign asking the provincial and federal governments to fund a long-term housing strategy. “Governments have more or less abandoned their participation in housing, and left it essentially to the municipal government,” said Kerur. Housing Connections, the organization that administers the City’s social housing intake process, has noted that several longstanding provincial and federal housing grants are set to expire in the coming months and years. However, Kerur emphasized that additional funds alone cannot solve the housing crisis. Governments can also provide assistance to low-income home owners, said Kerur. That would both increase the rental stock and help low-income people fix rental units and homes so they can stay housed in their communities. While provincial party leaders have said little about housing during the campaign, some parties have taken stances on certain housing issues. In response to a questionnaire from the Toronto-based church Neighbourhood Unitarian Universalist Congregation, the New Democratic Party said it would “extend the Long-Term Affordable Housing Strategy for a further 5 years with $80.1 Million annually” if elected. The party did not say how it planned to pay for the funding commitment. Ontario Liberals answered the same questionnaire without making any mention of new housing units for Ontario. The Progressive Conservatives responded to the questionnaire on equity, housing, and the environment with a letter about their plan to create a million jobs.